The Michigan Office of the Great Lakes today released the 2016 State of the Great Lakes Report. The OGL invited authors from state agencies, academia, and the private sector to discuss initiatives and events of note to the region and watershed for the annual report. 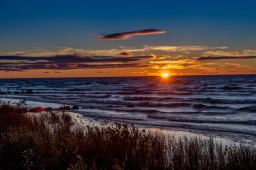 The Great Lakes are a foundation of the Michigan way of life, and the State of the Great Lakes report reflects on a range of ecological, economic, social, and cultural perspectives by sharing water-related developments affecting the region. Readers will learn about the release of Michigan’s Water Strategy, the future of Great Lakes maritime transport, and the importance of collaborative action toward wild rice restoration. They will gain insights on ways to limit the threat of aquatic invasive species like the New Zealand mud snail and explore efforts to track the impacts of water restoration projects through Blue Accounting. Important issues like microplastics pollution in the Great Lakes and access to water resources for those with disabilities are discussed with a look to future research and actions. “The State of the Great Lakes report provides us with an opportunity to celebrate the year’s successes and seek next steps to making the Great Lakes healthier and our Great Lakes communities more vibrant,” said Office of the Great Lakes Director Jon W Allan. Read the entire 2016 State of the Great Lakes report at: www.michigan.gov/documents/deq/SOGL_2016_546173_7.pdf. Discover how the Michigan Office of the Great Lakes works to protect and restore Michigan’s water resources by visiting www.michigan.gov/deqogl or calling the office at 517-284-5035. You are subscribed to Great Lakes Notes for Michigan Department of Environmental Quality.